Language for Learning helps develop strong language skills and give young children and ESL students a solid foundation for literacy. Not only do students learn language skills, they also learn to think. They learn to group objects in different ways, to see the logic behind rules and strategies, and to know how and when to apply these rules. 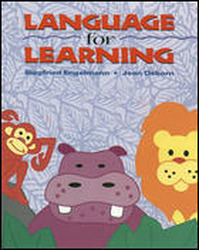 Language for Learning provides practice in vocabulary, word and sentence variety, the development of precise word knowledge, and in hard to teach concepts such as some/all/none and same/different.